The 2017 LG Showcase - Signature 4K OLED, CordZero & More! The theme of the 2017 LG Showcase was “Innovation That Goes Beyond“, and it showed in the products they showed off. 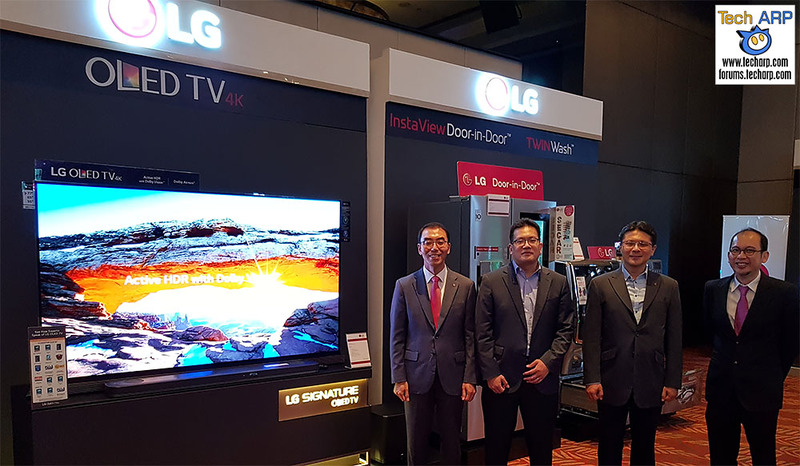 This year, they revealed a wide range of new consumer products, from the new LG Signature 4K OLED TV and CordZero vacuum cleaners to the LG Smart InstaView refrigerator and the LG TWINWash washing machine. Find out what’s new from LG this year! This year, LG introduced a slew of new OLED and Super UHD TV models, including the new LG Signature 4K OLED TV. They all feature Active HDR and support both HDR10 and Dolby Vision HDR formats. The new LG Super UHD TV line-up features the Nano Cell technology that allows for a wide colour gamut that is 64x richer than that of a conventional TV. The Nano Cell technology also helps to absorb unnecessary light waves, resulting in purer and cleaner colours. LG also took us on a tour of the 2017 LG OLED and Super UHD TV models, which we will share with you shortly. LG also showcased the new home appliances, from the new LG TWINWash washing machine and the LG InstaView refrigerator, to the new LG CordZero family of cordless vacuum cleaners. They also introduced a new range of air conditioners with a dual inverter compressor, and a new Mosquito Away technology. Make sure you check out the amazing RoboSense technology, which lets the compressor of the LG CordZero vacuum cleaner follow the user automatically. The Mosquito Away technology is also very interesting, because LG claims it will repel up to 82.5% of mosquitos using ultrasound. Finally, LG showed off their latest LG PuriCare air purifiers, which feature a PM1.0 sensor and WiFi controls. It also has a Clean Booster fan, which allows it to quickly filter the air in a larger room. Be sure to check back for the product tours of these new LG home appliances! Next : The Kingston KC1000 NVMe PCIe SSD Announced!